Yes, it would seem that I was spoiling my house-sitter. It was my last evening before my Florida trip and the evening my house-sitter was arriving. Our house sitter is a good friend of our. We have known him for about 12 years (one year less than I have known my husband). I enjoy it, when he comes for dinner. What is not to enjoy…he loves to eat (especially home cooked meals), enjoys wine and appreciates cooking done. It’s very easy to want to spoil someone like that 🙂 I decided to do a roast chicken. Roasting chicken basically takes care of itself! So while I am busy cleaning and packing, dinner was cooking (and filling the house with a wonderful smell). I wanted a milder tasting chicken that had just enough warmth (cumin) to make it taste good but mild enough to make some nice sandwiches during the week, for my house-sitter. I accompanied this roast with homemade gravy, some of the Italian Bread, Five Bean Salad and some spiced mashed sweet potatoes (recipe tomorrow). Overall, a very satisfying meal. We thoroughly enjoyed it! I definitely want to do this again! Liberally spread spice mixture all over chicken. Try to place some spice under the skin and inside the cavity of the chicken. Bring chicken to room temperature and place in a roasting pan with a lid. Make at 350 F for 1 hour covered. Remove chicken from oven and remove from pan. Meanwhile, strain the drippings leftover in the pan and remove as much oil as possible. In a medium sauce pot, melt butter with flour, whisking constantly. Let flour cook for about 5 minutes (skip cooking if using cornstarch) and then slowly add, whisking constantly, the drippings from the roasted chicken. Keeping whisking until all drippings have been added. If gravy thickens and you do not have drippings left, use chicken broth until gravy stays at a pourable consistency. Taste and season with salt and pepper, as necessary. 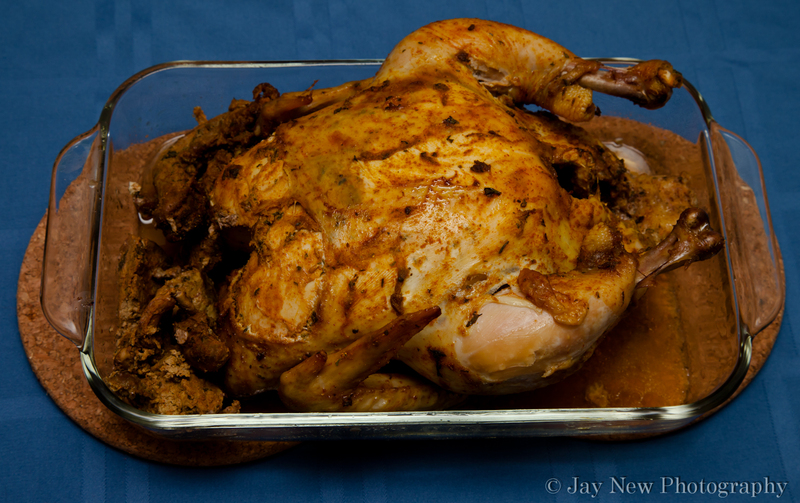 I never had tried cumin on roast but looks like would start using it, that chicken looks so juicy and delcious. That chicken looks so good it makes me want to roast one up myself! Your spice blend sounds delicious. Lucky house sitter! Thank you so much 🙂 I really adored the bread you made, for your blog today. I absolutely LOVE making bread. I have a batch of rolls resting for tonight’s dinner, in my kitchen 🙂 I am looking for recipes for whole wheat bread, for daily use, that is soft and not to crumbly (that will stay good for a few days). Do you have any recommendations? Sorry I didn’t respond earlier! I just realized how to monitor comments, and had missed quite a few! Here’s a nice whole wheat bread recipe from my favorite Peter Reinhart. I haven’t tried it yet, but I’m sure it’s great if you feel like giving it a go! -Remove them from the pans and cool them on racks for at least an hour before eating! Someone once left store-bought, store-bought! !, BBQ sauce in our fridge. My wife gave it back to them. LOL oh dear. Kudos to your wife! I am terrible at making gravy so your recipe and how-to are very helpful. The chicken looks gorgeous and yes, you are spoiling your house sitter, but that’s very nice of you and in return he will probably take very good care of the house. Looking forward to the potato recipe. This roasted chicken looks great. I don’t normally use cumin but I think I may experiment with it. And if I found a great person, like yourself, to house sit for that cooked me the most amazing culinary experience, I would make that into a career LOL. Thank you Babygirl! *HUGS* You are so sweet. One day 🙂 we will have to meet. You pick the movie and I will make dinner. Deal? This looks awesome. I can’t say how many times we’ve left the house sitter something only to find that they thought it was off limits and, the horrors, bad take out in the fridge. lol Yes, I can imagine having to take that out of the fridge *shudder. * I actually gave him a tour the kitchen prior to leaving, so he knew where everything was and all the foods I left for him. I was pretty happy to find, that when I returned, the kitchen as clean and there were no (significant) “horrors” found in the fridge.